Music is helping both young and old in Brazil feel empowered as leaders and members of a community thanks to the LEAM (Leadership and Development by Music) cultural project first initiated by Global Peace Foundation (GPF) Brazil in December of 2016. 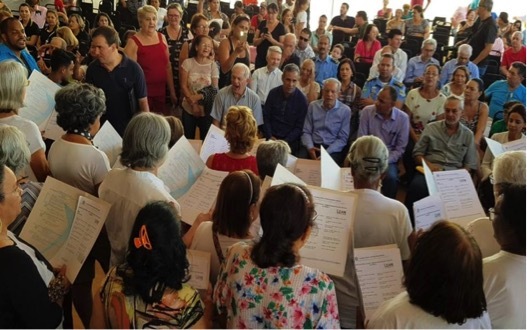 Starting from May 2018, LEAM expanded to CRAS Vila União (Social Assistance Referral Center) in the city of Goiania to include fifty elderly women in the music and choral initiation classes. Over the years, the project has included performances at local festivals, like Family Day, drawing people together and allowing participants to develop leadership and citizenship. Youth who are a part of LEAM especially feel more capable to become ethical leaders committed to improving human relations. The program hopes to continue providing training courses, educational lectures and citizenship workshops based on moral and innovative leadership and musical education to support cultural and artistic diversity, which generates social and cultural inclusion for children, adolescents, adults and the elderly. Now that the program has expanded to include the senior women from CRAS Vila União, members of LEAM expressed a deeper appreciation for both the youth and elderly in their family and community. LEAM is not just about music itself but rather the power it has to bring people together, developing teamwork and a mindset of collaboration to make a difference in the community. Since May, LEAM has donated 800 pieces of clothing used for a charity bazaar being put on every month by the elderly women and supported by the youth in the community. 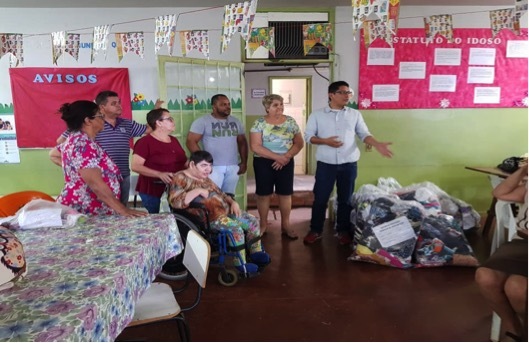 After the first public appearance of the choral in September 2018, the prefecture requested to expand the program to other CRAS centers in the city with the support of the Social Assistance Department of the city hall of Goiania. The Professor and Maestro of the LEAM project, Edenivan de Deus Santana, was moved by LEAM youth when they said they felt that the moment they touched their instruments, it was possible to truly transform all environments in a welcoming and healthy way. The ongoing project is a path to social and cultural inclusion as students learn essential musical skills and the value of creating something beautiful and meaningful together as a community of young and old. Visit the LEAM project on Facebook and sign up for monthly newsletters for the latest from Global Peace Foundation.